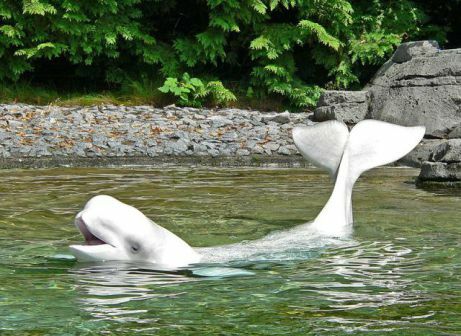 Beluga whales, or white whales, are the smallest species of whale. Beluga is derived from a word that means "white one" in Russian. They are born gray or brown and fade to white as they mature. They have a rounded head and no dorsal fin. Unlike most whales, the beluga has a flexible neck that allows them to turn their heads in any direction. They grow to be 13-20 feet long. Belugas are known for being sociable, which is of concern, since familiarity with humans jeopardizes their safety. Belugas are considered "near threatened." Of the seven Canadian populations, two are listed as endangered. For now, the residents of Rigolet enjoy going down to the wharf and watching Bella playing in the bay. Sometimes Bella will come over to say hi and let them pet him. It makes you wonder why Captain Ahab had so much trouble catching up to his white whale when they are such friendly creatures.